Shopping with children has long been a unique form of torture. “I want that, I’m tired, I have to pee, why can’t we go home…” and the list goes on and on. As if that weren’t bad enough, once children learn how to read, you really have to pick your aisles carefully. Danger lurks everywhere: feminine hygiene, hemorrhoid creams, lubricants, and let us not forget, the ever present condom- so many fun family topics! We were in a particular pharmacy for the first time and I did not know the lay of the land. 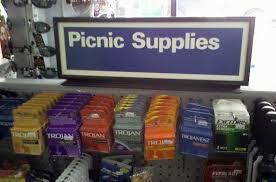 All I wanted was to purchase sunscreen when we mistakenly walked by a section of condoms. I ushered my children through as quickly as possible but one of the boxes caught my son’s eye and he started repeatedly asking “what’s that? what’s that?” as I dragged him down the aisle. “Nothing, dear, nothing at all!” I sang as we made it out of the danger zone. “But it said ‘surprise’ on it. I want to be surprised….” Damned advanced kindergarten class! And no, son, no you don’t want to be ‘Sir-prized!’ Trust mommy. “Yep, poor, poor mommy!” See how easy that was? It’s very important to create an understanding in your kids’ minds that there is an adult world that they have no business in, and that we as parents are protecting them from this world. Once they can wrap their pretty little heads around that fact, you can easily push them away from an unpleasant topic. Remember, items such as condoms are gateway drugs to all sorts of peril. And by the by, the only thing that should be ribbed is your sweater. ← Leprechauns- less likely than a tooth fairy?